Unique and intimate Boutique hotel, set amid some of St. Lucia*s most luscious and awe-inspiring vegetation. Merging with the rainforest, the open-air restaurant, the cocktailbar, the fresh waterpool and each of the rooms have spectacular views of the Pitons, the beautiful bay and the charming old French capital, Soufriere. 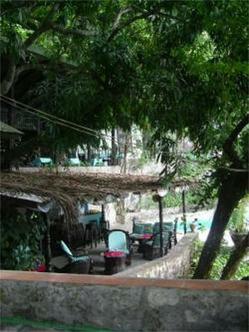 The hotel has been designed as a complete retreat, decorated with hand-carved furniture and antiques. Guests can sleep under the stars in the open Shangrila units with four-poster beds draped in muslin, or in our spacious Eden units with four-poster beds, sleeping sofas, sitting areas, air condition, private plunge pools, large bathrooms and terraces. Guests can enjoy a drink in the cosy tree house bar or a massage in the privacy of their rooms with natural fruits and oils. Holidays at Mago Estate Hotel are pure relaxation and revitalisation for those seeking a romantic hideaway.